Searchers looking for the lost ships of Sir John Franklin's 1845 Arctic expedition have discovered small artifacts and bits of human remains connected to the doomed polar mission. More than two weeks into the multi-agency quest led by Parks Canada to find any hint of HMS Erebus and HMS Terror in the icy waters of Nunavut, the British vessels remain elusive. 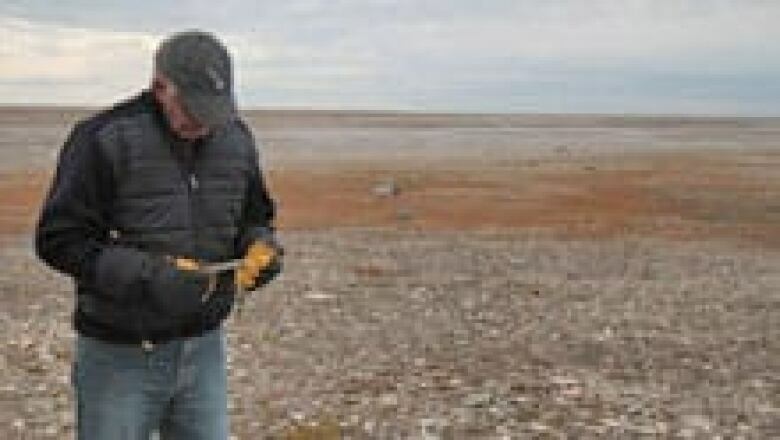 But searchers going ashore to known Franklin archeological sites on King William Island have discovered buttons, wooden debris, a toothbrush, bone fragments, a tooth and other small items. Watch The National Monday and Tuesday night on CBC on both CBC Television and CBC News Network for a full report on the search for Erebus and Terror, with Peter Mansbridge in Nunavut. Ryan Harris, Parks Canada's lead marine archeologist for the search, says the finds are "very interesting," but it's too early to draw conclusions about their significance. While the North is a cold and unforgiving place, its nature also in some ways aids in the chance remnants of Franklin's lost expedition can still be found. "Things work into the permafrost," says Harris. "It's sort of like preserving something in a freezer, so generally you don't see conditions of corrosion and rot that would complicate preservation in a more southern location." 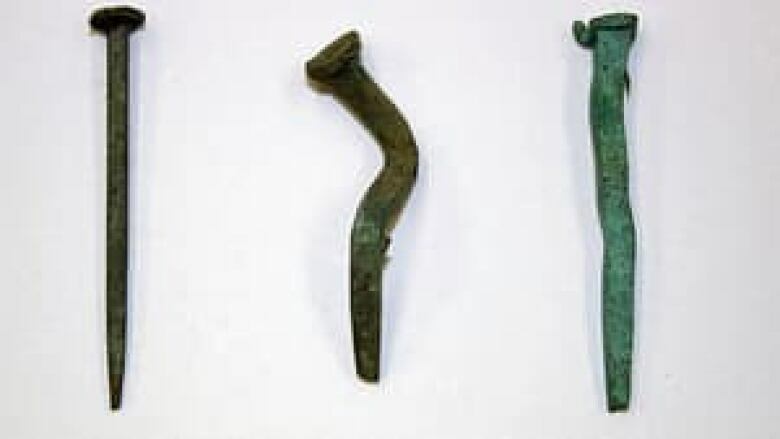 Other items discovered by the archeological crew led by Prof. Bob Park of the University of Waterloo and Doug Stenton, director of heritage for the Government of Nunavut, include screws with Royal Navy symbols, pieces of textile, bits of scrap iron and small square nails. The bones appear to be human. "When I landed by helicopter, the two research scientists were quite excited because they’d found some metal artifacts and some fragments of human bones, and their prize, a human tooth," Mansbridge wrote in a blog posting. "I was excited, too, fascinated with their finds and their work, so they gave me a quick lesson in what to look for and how to spot what to some was ordinary, but to them was extraordinary and important." A few minutes later, Mansbridge found two bones and what the archeologists think is a toothbrush from the 1840s, virtually intact. Franklin and his crew of 128 men had set sail from Britain amid great optimism in 1845, hoping to find the Northwest Passage. According to Inuit testimony, recorded by search parties after the ships were beset in ice in 1846 and deserted by their crews off King William Island two years later, one ship sank in deep water somewhere west of the island. The other went further south, perhaps as far as the Queen Maud Gulf and maybe into Wilmot and Crampton Bay. The men all died, a sad demise that has never been fully explained and which has become something of a Victorian gothic horror story, complete with hints of cannibalism. 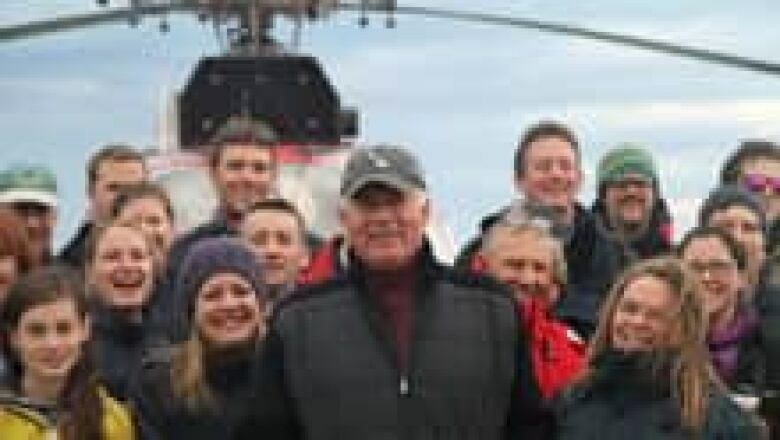 The current search is the fourth in five years and a joint public-private sector endeavour that involves, among other groups, the Canadian Coast Guard, the Canadian Hydrographic Service and the private Arctic Research Foundation, which has provided a research vessel, the Martin Bergmann. The search has so far covered about 150 square kilometres, or approximately half the area that was the priority for 2012. That area was determined based on Inuit oral histories and scientific studies of ice formation, drift and breakup. Harris says the area that is the current focus of the search is one that would have been "a very dangerous place" for a wooden ship like Erebus or Terror because of ice conditions. While the quest for Erebus and Terror has been a prime focus of the efforts in the Arctic, crews from the Canadian Hydrographic Service have also been charting the sea floor. So far, the service has gathered enough information to create a preliminary electronic chart that expands the area for navigation in the Alexandra Strait. Harris says the work creating that navigation corridor will allow coast guard ships and other vessels to shave about 6.5 hours off their transit time around the southwest corner of King William Island. "I think that is going to be a very significant navigational achievement." While Harris says this year's search has unfolded much as planned, Mother Nature hasn't been making it easy. "The weather [is] predictably bad," says Harris. "Particularly when you get into the month of September, the winds become more persistent and strong." That's especially problematic for sonar scans done by towing a device behind a small vessel. "As the boat bounces around more in the waves, the sonar record gets less clear and less reliable," says Harris. But crews have various systems and survey tools that can be deployed, depending on the environmental conditions. For Harris, the search has provided perhaps a hint of how Franklin and his sailors would have felt as they looked out over the frigid waters of the Northwest Passage. "You look all around and you might not even see a spot of land," he says. "You get ... maybe the sense of what it must have been like to gaze out from Erebus and Terror some years ago and see nothing." The search is scheduled to continue until the final week of September. The Canadian Coast Guard icebreaker Sir Wilfrid Laurier, which has been supporting the search, leaves Tuesday to complete other work on its annual northern mission. 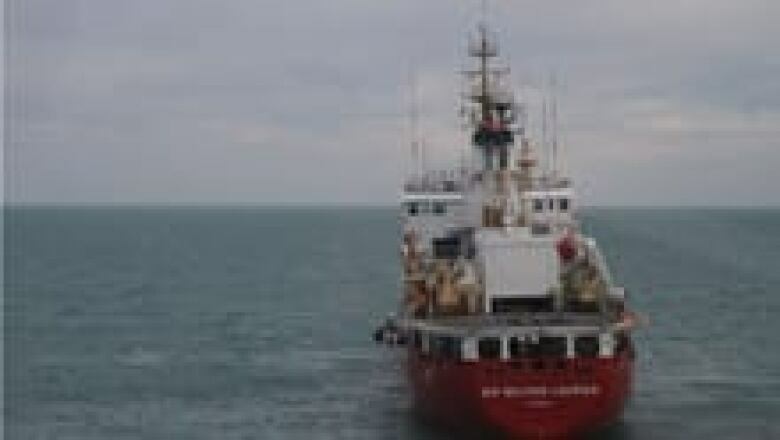 Harris and a Parks Canada colleague will transfer to the Martin Bergmann and a decision will be made, based on weather and other factors, whether to move the search to the more southern location where the second ship might have gone down. Watch The National Tuesday night on CBC for part two of their report on the search for Erebus and Terror with Peter Mansbridge in Nunavut.